A brief blip in my restaurant life was when I held a chef position at Jean Georges’ Prime Steakhouse inside the Bellagio in Las Vegas. It was a fabulous place adorned with cut crystal and sterling silver set against deep chocolate browns and baby blues. I was fresh from The Culinary Institute of America and I was certain that a single plate or steak knife cost more than any of my possessions were worth combined. Our cook team was fantastic and the waiters were smooth as butter. The place was so classic and so outstanding from any angle that I couldn’t help but to be caught up in the magic web that was spun for guests. I opened tens of thousands of oysters, grilled whole herds of prime ribeyes and seared entire schools of dover sole. It was my first high level professional kitchen and I was in love. Since then I have been there and done that in our industry’s tight knit world but my love for a great classic steakhouse has never left. Thankfully I have an amazing throwback steakhouse practically right next door to Milestone in El Dorado Hills. C.Knights Steakhouse is relatively new and I have to say that the food is exceptional, the service is good, the bar team mixes a grand manhattan and the friendship developed with Chuck Knight, the owner, is one of the great bonuses to the time and effort spent grinding away in this business. People may know Chuck from Ruffhaus Dog and Burger Pub, also in El Dorado Hills Town Center, or from his “Dog VW” where he caters events at local concerts and wineries. Yet I doubt most folks know his rather important local history. Chef Knight set up Henry’s Steakhouse inside of Red Hawk Casino and before that was the executive chef of The Slocum House which arguably afforded him the most important chef position in the city. Chuck is a lucky man. He has somehow managed to balance an intense work life with an incredible family while at the same time shrugging off the white coats and tall chef’s toque in favor of slinging the best hot dogs in the entire region. His new project C.Knight’s Steakhouse steps up the offering but maintains his understated and extremely high quality offerings. Just as Ruffhaus is the best dog shop in the region I would argue that C.Knight’s Steakhouse could easily hold that distinction amongst steakhouses as well. Charmingly it is quite hidden and out of the way. In the south back corner of the Cinema promenade in Town Center is it tucked behind potted topiaries and weathered fencing. As you step inside you’re immediately taken back just a bit. Nothing is trendy and everything is classic. Tufted black leather booths and chairs. Black linen and crystal stems set the dining room and soft guitar music set the stage for a high quality, yet understated experience. I cannot overstate the quality of the food. Never, even in the days of my steakhouse chefdom, have I been more impressed with the quality of food and flavor produced from a steakhouse. The star of the show at C.Knights is obviously selection of USDA prime, Wagyu or Angus Beef. All of the meat is seared on an impressive double broiler (an enviable piece of equipment) and served with sizzling juices as the plate comes to the table. While the high quality beef is the draw there is some serious magic in the rest of the menu. Sides include Au Gratin Potatoes, Forest Mushrooms and “Green Phunk” a wizard-like preparation of creamed greens. No trip begins without enjoying the garlic butter escargots. 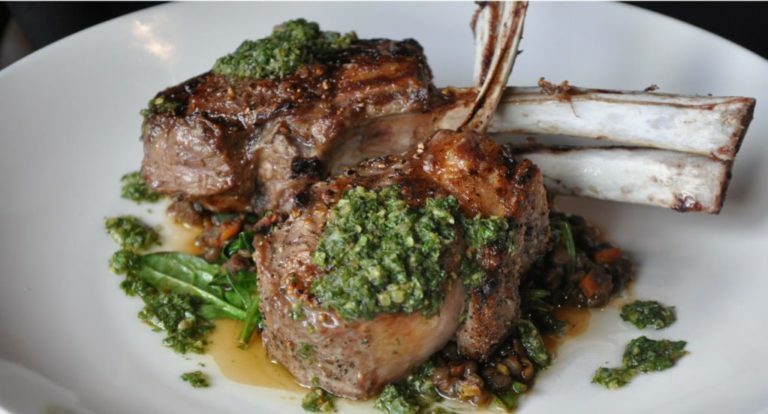 And while we have certainly enjoyed nearly every steak on the menu as a chef I would have to say that the lamb chops with green lentils or the double bone in pork chop are the best I have ever had, local or otherwise. I have never had anything less than amazing food at C.Knights and I’m always pleased to hear when our guests at Milestone wax poetically about the lamb chops. Hospitality is an interesting business. Busy, brutal, tiring, competitive, satisfying and at times crazy. Yet there is something wonderful that happens when mutual respect for technique and product collide. The joy you find when another chef’s food makes your tummy happy is beyond description. Realizing a kinship with someone out there, locally, who cares about food, hospitality and the community as much as you do makes us family and neighbors, transcending competition. If you live in Folsom, El Dorado Hills, Cameron Park, Shingle Springs or Placerville I will not hesitate to state that C.Knight’s is the best steakhouse in the region and I would encourage everyone to visit. I know you’ll be just as pleased as I am to add C.Knight’s to your list of regular haunts as it is on my very shortlist when I am away from Milestone. Nick Dedier III is the chef and owner of Milestone Restaurant in El Dorado Hills. He is a weekly columnist for the Mountain Democrat newspaper. He can be followed on facebook.com/nick.dedier.